When I ask my natural clients what made them want to go natural they all tell me the exact same thing which is because they wanted healthy hair. So that leaves you to wonder, are relaxers bad for your hair? 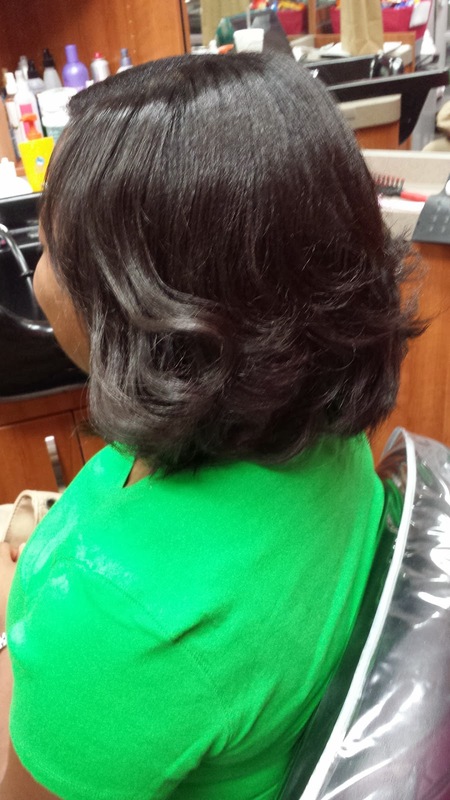 Take it from me, someone who has had a relaxer since I was very young, relaxers are NOT bad for your hair. They can, however, be damaging and do extensive harm to your hair if they are used incorrectly. So, when your hair is properly being cared for and it is done correctly, a relaxer is not going to make it unhealthy. A lot of women don't realize that relaxers contain very harsh chemicals, mainly sodium hydroxide, in them. This is why it says on just about (and I say "just about" because I can admit that I have not looked at every relaxer kit to know for sure) every relaxer package "for professional use only". We hairstylists have actually been trained on how to correctly apply them which is why I always tell women to never do their relaxers at home. Also, lots of women who tell me the relaxers damaged their hair also admit to me that they did their own relaxers. This is not a coincidence. 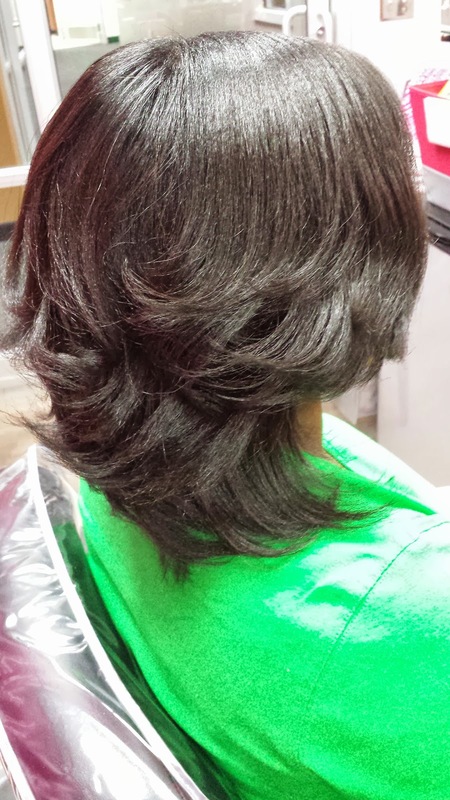 When done correctly a relaxer should never burn unless you have a scalp condition and should not damage your hair. 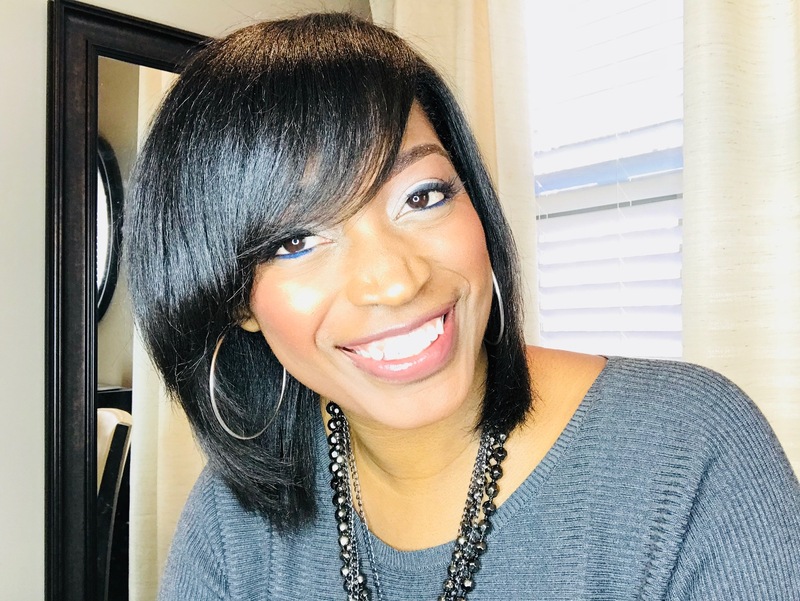 Doing it themselves- I know it is very tempting to do your own relaxer, especially when you really don't have the money to get it professionally done and you see that you can buy one in the store for $5. Believe me, I totally get it as I have been in that situation myself before. But, as tempting as it may seem, this is a big no-no. 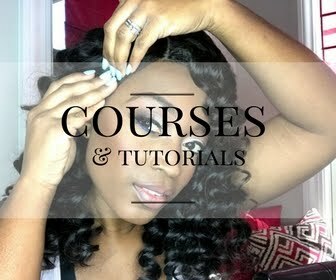 You many not see the damage to your hair after the first or maybe even the second time you do it yourself, but believe me you are damaging your hair. You can't see what you are doing and 9 times out of 10 you are overlapping. 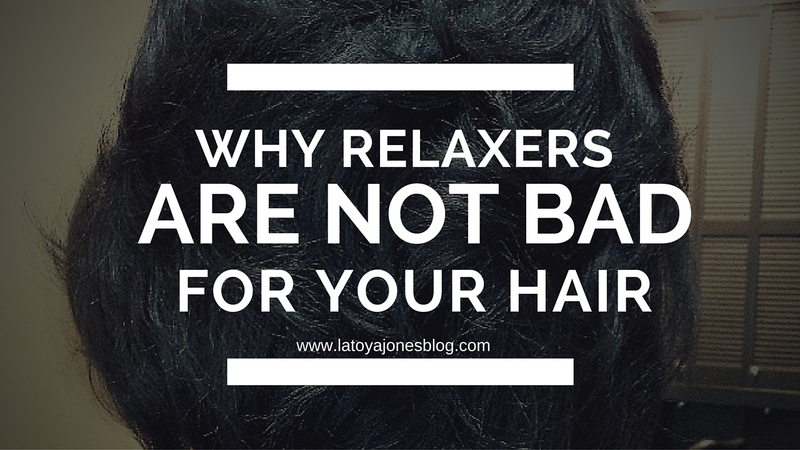 Getting them too often- I've had some women tell me that they get their relaxers every FOUR weeks! And their hairstylist is actually doing it!! Hearing this makes me cringe. You should only be getting your relaxers done if you have at least two inches of new growth. Unless you are taking some kind of super-vitamin that you are hiding from the rest of the world, your hair is not growing out two inches in four weeks. Just because you see a little wave or ripple of new growth doesn't mean its time. 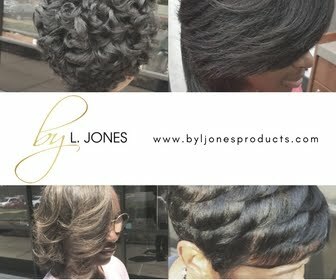 I have actually had a client stop coming to me because I wouldn't give her a relaxer when she wanted one. But guess what? She will never be able to say I was the stylist that made her hair come out or wasn't taking care of it! 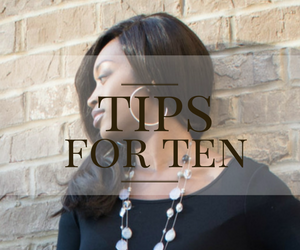 Brush or scratch the scalp right before a relaxer- Never brush or scratch your scalp before you receive a relaxer, especially around your edges. It irritates your scalp and leads to scalp burn. 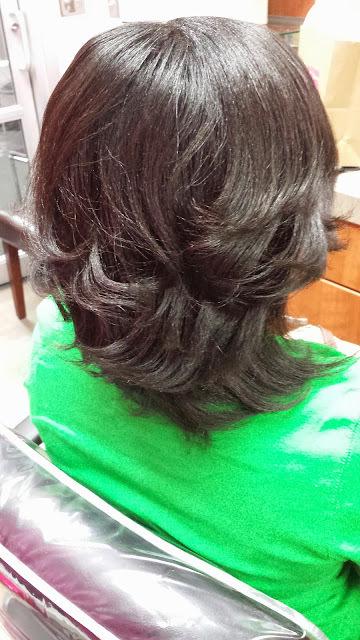 Overlapping- Overlapping is relaxing hair that has already been relaxed. Overlapping always leads to damage and breakage over a period of time. If your relaxed hair used to be thick and you notice your hair is now very thin and somewhat brittle, overlapping is probably the reason why. It is highly unadvisable to relax hair that has been relaxed and you never relax hair down to the very ends. So, the next time you see that $5 box relaxer, don't be tempted. If it hurts you financially to get your hair professionally done, stick to only getting your relaxer professionally done and you can handle the shampoo sets yourself. Besides you should only be getting your relaxers done every 12-16 weeks anyway which is about every four months. Also remember that it takes way more money to fix a problem or get your hair back healthy than it does to prevent it. I was the perfect example of the second point. I was sitting in the salon chair every 4 weeks with the first hint of a crinkle. If I couldn't get to the shop I was having my mom do it. Needless to say I was stuck at neck length for years. How sad was that. So glad I know better now and stretch 6 months or more. I'm a big fan of yours but I absolutely disagree that you NEED a stylist to do your hair. I saw a stylist every week for 10 years and my hair never grew past my neck. I started doing my own relaxers and in less than 2 years my hair has grown to bra strap. So not every stylist knows what they're doing. There's a plethora of great blogs (like yours) and videos that give amazing advice to novices like myself, and many DIYers that have had amazing success on their own. Right now I have NO plans to ever return to a stylist. So I wish you'd be a little more open and not say that you cannot have healthy hair if you do it yourself. I'm speaking from my experience and what I have seen personally. If you have had success doing your own relaxers that is fantastic, but I believe there are more people that are damaging their hair by doing their own relaxers than helping it. This is why I just say as a general rule to not do it. And I do agree that every stylist doesn't know what they are doing also. But congrats to you for getting your hair to grow that long! Not everyone can do that on their own. With proper care, her hair will not fall out, but instead be a lot more manageable. If you continue to get them, space them out to every 4-5 months or 16-20 weeks to avoid damage. Latoya: You are correct that relaxers need to be professionally applied by a seasoned Cosmetologist. 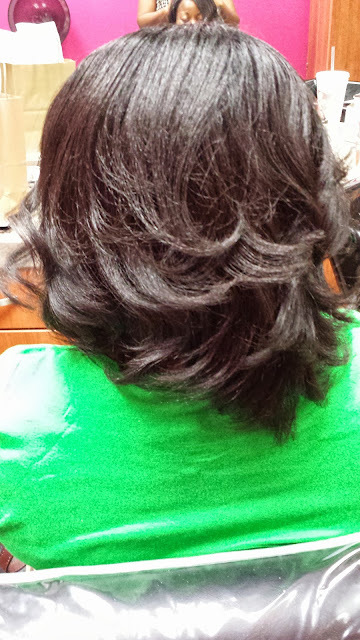 I had a relaxer for years and have been natural since March 2012. I got tired of giving al my $ away to get my hair done. I didn't have any problems with my hair. It was long. Of course, there has been some breakage in my natural hair journey. My hair is growing back now without chemicals. I'm not against women who choose to relax becauseI was once one of them. I appreciate the fact that you are letting people know it is ok as long as it is done by a professional because most people can't perm & retouch there own hair. When I want to wear my hair straight, I use motion 3 step so I don't mess up my natural curl pattern. Hi, so I am freaking out. I got a relaxer, when the woman tried to do it, she got 2 containers because my hair is extremely thick. Do I have to do it again?